Rime vs. Rhyme: What’s the Difference? Home » Rime vs. Rhyme: What’s the Difference? Rime and rhyme are homophones. In one context, they are alternative spellings of the same word, but rime also has other meanings. Which word should you choose? If you are an ancient mariner, you only have one real option. The rest of us need more information before we can choose rime or rhyme. I will discuss what kind of information is needed in this article. What is the Difference Between Rime and Rhyme? In this article, I will compare rime vs. rhyme. I will use each word in a sentence to demonstrate its proper meaning. Then, I will explain a helpful mnemonic that will make it easier to decide whether rime or rhyme is the word you should use. My car window was coated in an icy rime. Historically speaking, rime was also used in the context of poetry, like in the title of the Samuel Taylor Coleridge poem The Rime of the Ancient Mariner. In linguistics, rime also refers to the part of the word that follows the initial phoneme. In this context, the initial phoneme is called the onset. What does rhyme mean? Rhyme functions as several parts of speech, but its main uses are as a noun and a verb. As a noun, it means a poem or the correspondence of sound in words or lines. Rhyme is typically used for creative purposes in poetry and lyrical music. It is very difficult to find a rhyme for the word orange. In a classical Elizabethan sonnet, the two ending words in each couplet must form a rhyme. “Here is a little rhyme I’ve composed about my wonderful wife, Lisa,” said the poet at an open mic night. As a verb, rhyme means to arrange words in such a way that their sounds correspond, or to have corresponding sounds. Meat and feet rhyme, and feet are made of meat. You can be a great songwriter if you rhyme your verses well. In general, you should always choose rhyme. You should only use rime in reference to ice or frost or historical contexts involving poetry, like the Coleridge piece referenced above. Only linguists and speech language pathologists care about the linguistics sense of the word rime, and even some of them use rhyme instead. 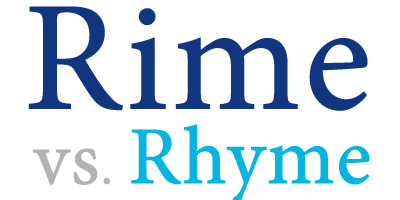 Trick to remember rhyme vs. rime: Since rime is spelled with an I, which is also used to spell infrequent, you will always be able to remember that rime is only used infrequently in contemporary English. Is it rime or rhyme? Rime and rhyme are homophones, which means they have the same pronunciation but different meanings. In some cases, they are alternative spellings of the same word, when referring to a correspondence of sounds in words and lines of verse. In the context of poetry, rime was historically correct, but has fallen out of favor in modern times. You should choose rhyme instead, except in specified historical contexts. Since rime is spelled with and I and used infrequently, you can remember to choose rhyme instead. Choose rime in context of ice and frost. Choose rhyme in the context of words whose sounds match. If you still need help remember whether to use rhyme or rime when discussing poems or songs, feel free to consult this article for additional help. 1 What is the Difference Between Rime and Rhyme? Eminent vs. Imminent: What’s the Difference? Story vs. Storey: What’s the Difference?